← MLB Stadiums Without Crowd Noise? I remember full-serve gas stations fondly. Perhaps it was a longer-lasting holdover because we were in the Midwest, but we didn’t lose ours until after the 1979 OPEC oil crisis. 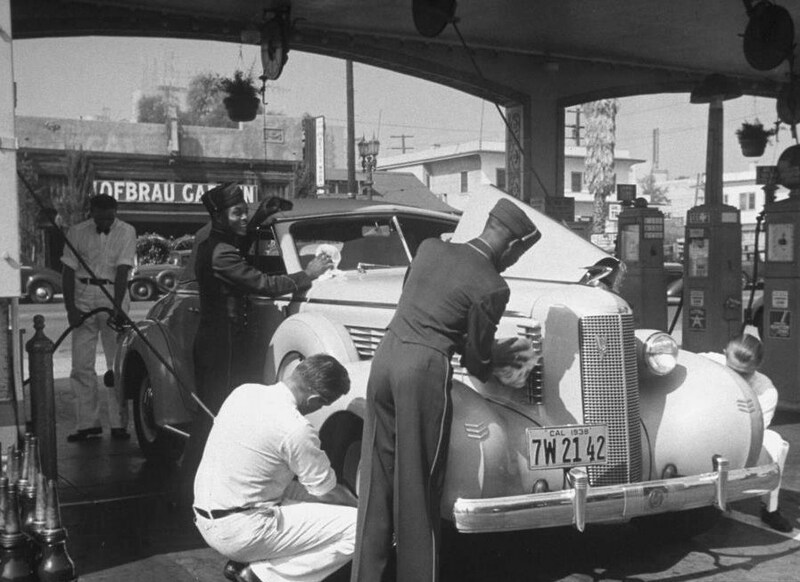 Even though I was a feminist who “could do it myself,” I much preferred the cute or macho attendants who pumped the gas, washed all windows, and asked if they could check my fluids under the hood. Sad loss. Thanks for the memories, Mike! And thank you. Bringing that photo to my attention as you did spurred inspiration and a lot of fun. Fill ‘er up! I think we lost our full-serve gas stations in Maryland about the same time. I remember during the gas crunch of 1973 or 74 you could only get a certain amount of gas, or on odd and even days according to your license plate. Ah, for the days of 33 cent gasoline!